London based Eclipse Services is offering a new high quality advanced videoconferencing solution providing secure, reliable, cost-effective, fully supported HD resolution communications and taking advantage of exclusive non–public high bandwidth internet services, available only through Eclipse. With this new managed service, Eclipse Services – part of the Eclipse Presentations Group – can offer clients the huge flexibility of fully supported multipoint video meetings at maximum quality and efficiency. The concierge and bridging service can be tailored exactly to client requirements in terms of the number of participants, required points of connection, and wherever their location around the world. The service is secure, stable and provides seamless integration between VC and TelePresence units, codecs, laptops, desktops, iPads and other tablets, all with real-time audio and video synchronisation. During the conference session, documents can be opened and effortlessly shared live at the click of a button. Furthermore, Eclipse is offering a free two week trial for interested parties – with no obligation. 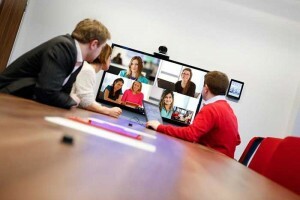 Videoconferencing continues to grow in commercial popularity as it can significantly reduce the need for travel to bring people together, making the process of national and international meetings faster, more efficient and secure as well as considerably more carbon neutral and sustainable. Eclipse sees this as a perfect opportunity to offer its clients a safe, rock-solid premium service using this highly convenient technology. Utilising a dedicated infrastructure ensures that latency is virtually non-existent and only two ‘hops’ are involved in the transmission process – for a clean, crisp, clear hook-up. Once the connection is established, multiple users can be invited to the virtual meeting room and participate. Eclipse will also coordinate the soft-client licensing agreements.